11/10/07, The Dakota: Frode Haltli's set at the Walker was a short one—just over an hour. That gave us time to arrive at the Dakota for the second set of Tim Ries's Rolling Stones Project. 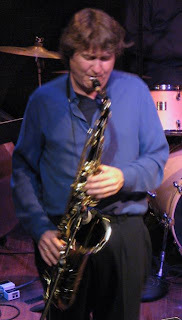 Ries has toured with the Stones since 1999 as part of their horn section. He is also a jazz musician, and jazz is where he goes when he's not on the road with the Glimmer Twins. On his second jazz CD, Alternate Side, he recorded a jazz arrangement of the Stones's "Midnight Mile." Mick and Keith gave their blessing for more. In the spring of 2005, Concord released The Rolling Stones Project. Richards, Ron Wood, and Charlie Watts (also a jazz musician) all appear on the CD; so do Norah Jones and Sheryl Crow. Other jazz artist guests include Bill Frisell, John Scofield, John Patittucci, and Brian Blade. 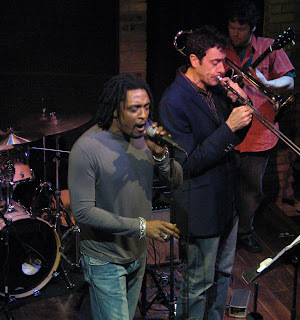 For his two-night stay at the Dakota, Ries brought along two other Stones tour veterans, trombonist Michael Davis and Bernard Fowler, Mick's backup singer. The rest of the band was cream-of-the-crop local musicians: Tom Reichert on guitar, Jeff Bailey on bass, Kevin Washington on drums. They began the set with a funky original tune, then gave us what we came to hear: "Ruby Tuesday," "Paint It Black" (in 7/4 time, so each measure sounded as if a syllable had been dropped), "Satisfaction," "Baby Break It Down," a lesser-known Keith Richards tune. 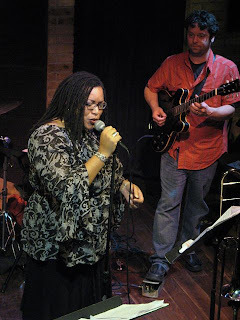 Lisa Washington, Kevin's wife, did a spoken-word performance of her poem "Possibilities," backed by the band, and on her way off the stage she stopped to kiss her husband. It was sometimes hard to separate my memory of a Stones tune from what I was hearing and seeing in the moment. But the set was fun and musical and I liked it. And after the snoozy music at the Walker, it was invigorating. Hey hey hey, that's what I say. Photos: Tim Ries by John Whiting; Bernard, Michael, and Tim Reichert; Lisa Washington and Tim.